"Yellow Rose of San Antonio Lissy" features a sassy blue-eyed, 12 inch articulated Lissy. 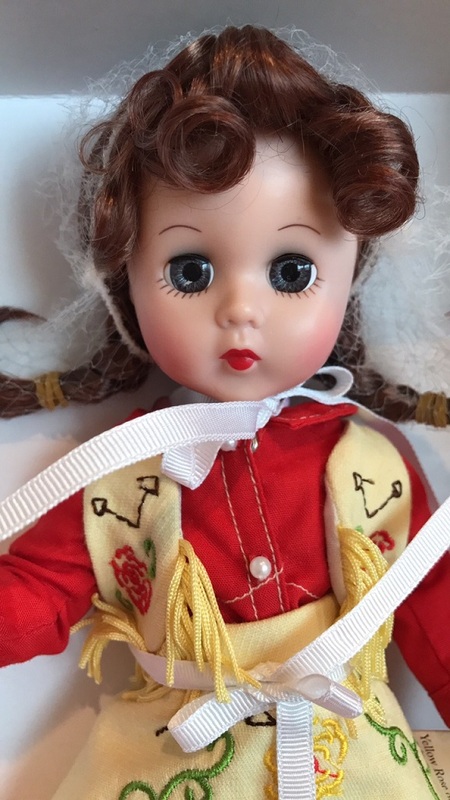 Her red hair is styled into curly bangs and flipped up braids. She's wearing a fringed, yellow vest and skirt which feature embroidered red roses. 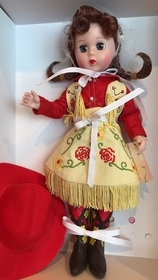 Her outfit also includes a bright red shirt with tiny pearl buttons and white top-stitching; brown cowgirl boots that zip up the back and have red leather trim at the top and sides and are embroidered with yellow roses; white lace-trimmed undies and a bright red cowgirl hat. Never displayed.